Our German Shorthaired Pointer socks are made from the finest quality cotton. We use 200 Needle count machines to make them while most of the companies only go up to 144 needle count. 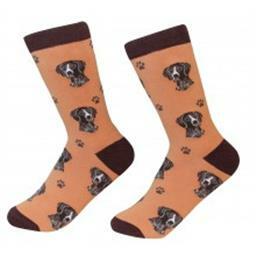 There are 20 to 24 German Shorthaired Pointer faces woven on each pair of socks. Best of all these socks are super soft and comfortable and they are machine washable. If you have a German Shorthaired Pointer you have to have a pair of these socks. These socks also make make great gifts for anyone in your family and friends.